Trai IFC Recommendations: Better Late, than Never! Trai’s recent recommendations on IFC (in-flight communications services) have been lauded by the industry. The in-flight communication services were introduced by airlines in Africa, Asia, Australia, Europe, the Middle East and South America over a decade back. Many countries adopted the provisions, but India lagged behind in catching up with other countries which were already providing this solution. However, it’s better to be late than never. The recent recommendation by Trai on IFC is a welcome move and if allowed by DoT, it would allow an additional revenue channel for telecom service providers as well as the aviation sector. As per estimates, the number of connected commercial aircraft is expected to grow from 5,300 in 2015 to 23,100 in 2025, accounting for 62% of the global fleet. Another study predicts that the number of aircraft offering wireless connectivity will rise to 14,000 by 2022 ( 50% connectivity penetration in commercial aircrafts. This study also projects that approximately 5,000 of these aircrafts will offer both Wi-Fi and cellular options. Thus there is a huge demand for in-flight connectivity across the globe. For India, it would be a step towards fulfilling the goals of Digital India and Make in India. “The introduction of IFC will add significantly to the objectives of the Digital India and Make-in-India initiatives– increased investment, higher economic productivity and innovation through the digital transformation of Indian society,” USIBC had said in its consultation paper to Trai. USIBC said that India should adhere to international practices that rely primarily on an aircraft’s home nation license as the best way to facilitate the introduction of IFC services in India. “IFC services in India will significantly improve passenger experience, and bolster non-aeronautical revenues for the airline industry. Further, it will create new revenue opportunity for Telecom service providers,” COAI had said in its consultation papers. Meanwhile, it also said that the Air -to- Ground (A2G) communications is best suited for the continental fleets (within a land mass). A2G communications has major advantage over the Satellite based IFC as it is more affordable, having low equipment cost, Quick installation time, Low cost per Mb, low latency etc. 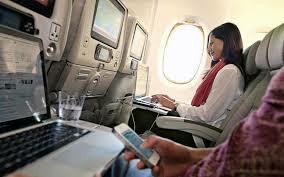 “Inflight connectivity and access to the Internet is available today in many parts of the world. We are somewhat behind other countries. More than 10,000 domestic and international flights go across India every day carrying more than 10Lakh travelers over the Indian airspace who would now have access to broadband connectivity. We laud the authority for making these forward looking recommendations in such a short span of time and urge the DOT for an early acceptance and implementation of these recommendations in co-ordination with MoCA ( Ministry of Civil Aviation ),” TV Ramachandran, President, Broadband India Forum said. Trai IFC Recommendations: Better Late, than Never! 0 out of 5 based on 0 ratings. 0 user reviews.